XML, the extensible markup language, is the emerging standard for exchanging information between disparate systems. This simple yet powerful technology has many uses in Notes and Domino business applications. 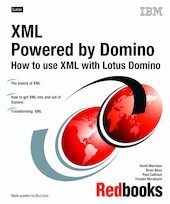 This IBM Redbooks publication will help you understand XML and how to use it on a Domino platform. In this book, we start with an introduction to XML, and describe its history, syntax, and related tools. We then describe how you can get information out of Domino in an XML format using tools you are already familiar with, such as views, forms, pages, and agents. Once XML data is extracted from Domino, we show how it can be transformed into other formats, like HTML, text, or other XML formats. Finally, we describe how to get data that is already in an XML format into Domino using agents and the Lotus XML toolkit.